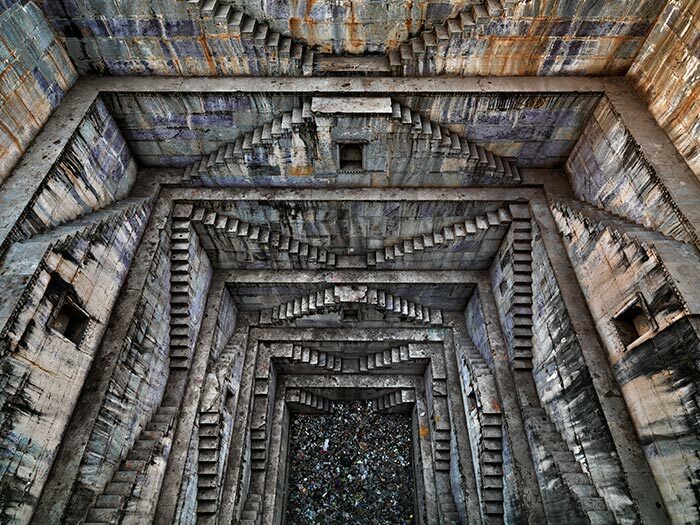 World-renowned photographer Edward Burtynsky, and acclaimed filmmakers Jennifer Baichwal and Nicholas de Pencier have been collaborating for nearly 15 years, starting with the award-winning documentaries Manufactured Landscapes (2006) and Watermark (2013). 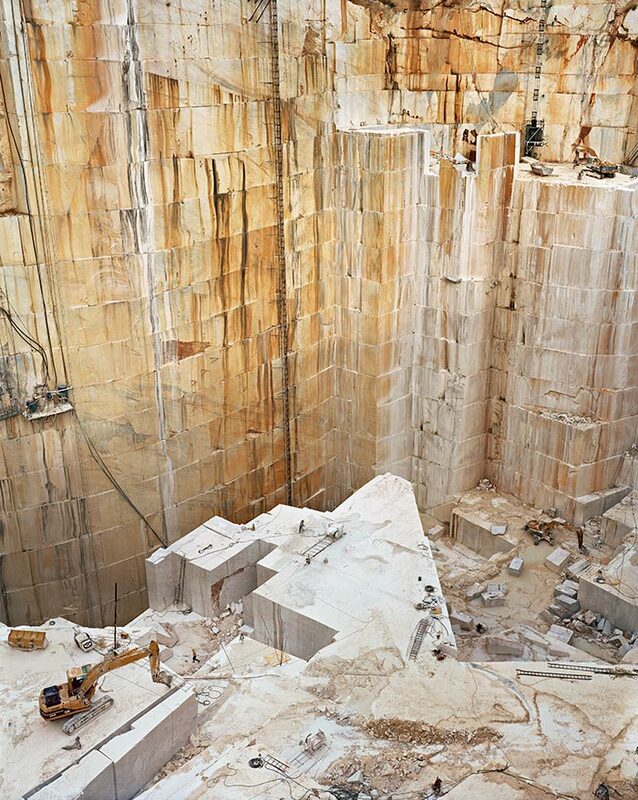 Their new project Anthropocene includes a documentary film (ANTHROPOCENE: The Human Epoch) which is now playing in select Canadian theatres, two complementary museum exhibitions now on at the Art Gallery of Ontario and National Gallery of Canada, and an art book published by Steidl. Thjórsá River No. 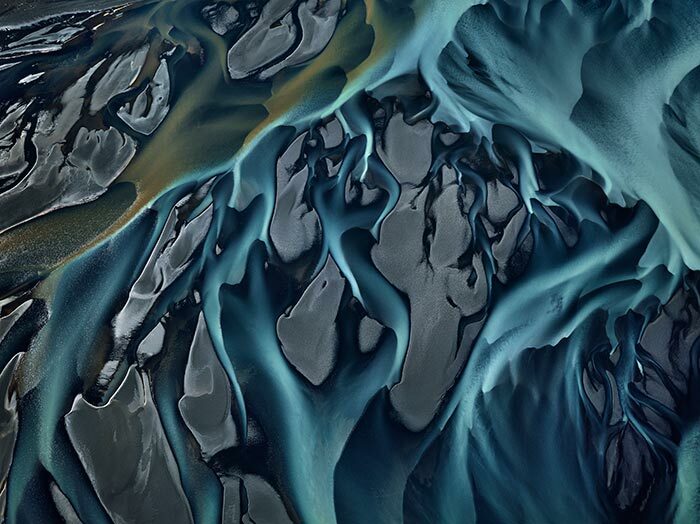 1, Iceland, 2012 Wind and water, fire and ice shape the geologically young island of Iceland, whose landscape is particularly vulnerable to erosion. After Norse settlement in the ninth century, deforestation led to rapid desertification and the spread of rofabards, sand escarpments that encroach upon and destroy plant cover. To halt this process, farmers are encouraged to seed hardy plants and grasses. Maintaining a productive landscape requires adaptability to the unstoppable forces of climate, geology, and water. The world’s population was 2.8 billion when I was born. Not quite six decades later, 7.2 billion humans inhabit the planet. This fact runs through almost all of my photographs, but it became especially relevant when I started to think about taking pictures of the earth’s water. My journey began in California, in 2008. 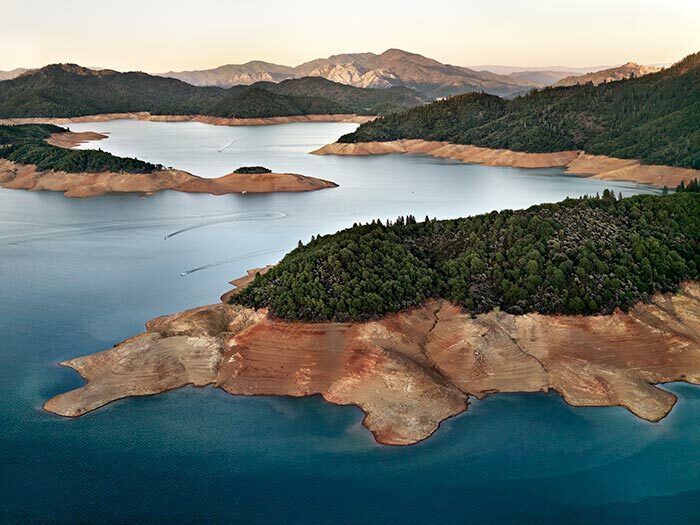 National Geographic had asked me to contribute to an issue devoted to water, and California, with 38 million people and an enormous agriculture industry, turned out to be a good place to start. For agriculture alone, the evidence of California’s dependence on a vast network of state and out-of-state rivers, water conveyance systems, reservoirs, and groundwater basins is massive—so massive that I soon realized a cherry picker could not give me the lofty perspective I required to tell the story. Water, and the impact of climate change on our supply, is simply too big a subject. I needed to convey this immensity. Once I came to understand the scale of what I was looking at, helicopters and fixed-wing aircraft became key tools for the project. I have always been drawn to landscapes, in part because we all are. Landscape, as a form of communication in art, is embedded in Western and Eastern traditions. Images of lakes and river valleys and distant snow-capped peaks reach across cultures. Even when the content of a picture is nothing like the pastoral origins of landscape, we understand the language. My photographs reflect the impact of humanity, not its absence. They are pictures of our footprint, and the diminishment of nature that results. 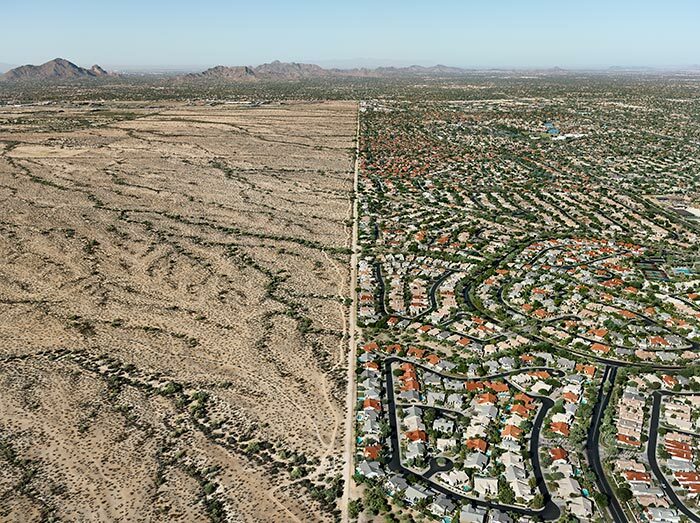 They are distressed landscapes: images of land, and now of water, that we have altered, or diverted, or transformed, or used in this unprecedented period of population growth, agricultural expansion, and industrialization. Documenting the point of impact between humankind and its evolving environment has turned out to be a life’s work. My nationality has something to do with this obsession. As a Canadian, I have a reference point you might lack if you grew up in the Netherlands or Manhattan. Of course, Canadians have cultivated and manicured spaces. I live in downtown Toronto, hardly a wilderness, but in Canada we are never far from places where one can see how the land looks without our presence. Around the globe, this has become a rare perspective. The sense that untouched nature embodies something spiritual constitutes a part of who I am, both as an artist and as a citizen. It is why I am so saddened by the environmental policies of many world governments—especially our own. It is why so many of my landscapes are laments. Being Canadian also has something to do with why—after photographing rail cuts, tailings, quarries, ship breaking, and factories—I have turned to water. As a photographic exploration, the Water project is cut from the same cloth as my previous ones. It is a continuation of the same story. It feels natural to me, even obvious, that a Canadian should want to tell it. I wanted to understand water: what it is, and what it leaves behind when it is gone. I wanted to understand our use and misuse of it. I wanted to trace the evidence of global thirst and threatened sources. Water is a part of the pattern I’ve watched unfold throughout my career. I document landscapes that, whether you think of them as beautiful or monstrous, or as some strange combination of the two, are clearly not vistas of an inexhaustible, sustainable world. Canada borders the Great Lakes, which contain 21 percent of the world’s fresh surface water. The other one to three million lakes in this country (depending on your definition of “lake”) hold even more. We are custodians of over one-fifth of a resource that is utilitarian in the broadest and most necessary sense: water enables everything to live. Without it, there is wasteland—end of story. Contrary to the propaganda of our federal government and the oil extraction and production industries, we are not an oil country. We are a water country. The implications and the responsibilities of this are enormous, and growing bigger by the day. The drama at the heart of water is that we have no alternative. Water has no workaround. When we talk about energy, we can talk about alternatives to fossil fuels. When we talk about communication, we can talk about better, more sustainable delivery systems. We have no options when it comes to water. We either have it—which makes our planet the miracle that it is—or we do not, in which case our precious earth is just another chunk of barren rock hurtling through space. Xiaolangdi Dam No. 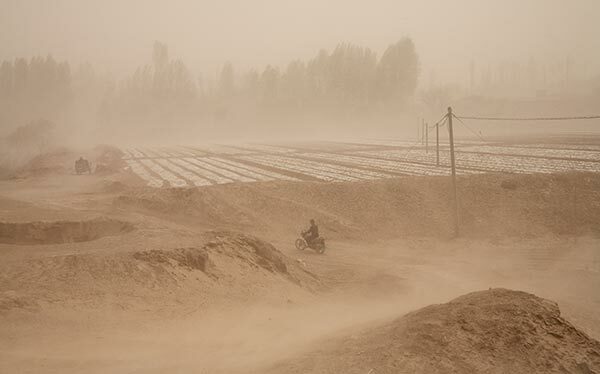 1, Yellow River, Henan Province, China, 2012 China’s power consumption is expected to double that of the United States within the next twenty years. To keep pace with rising energy demands, China has built some 700 dams annually since 1950, displacing anywhere from 10 million to 60 million people. Upstream, communities must move because of flooding; downstream, silt accumulates and can lead to subsidence and erosion. To avoid intake blockage and a reduction in power, silt buildup from the dam is released once a year. Pivot Irrigation No. 11, High Plains, Texas Panhandle, 2011 Centre pivots—long rotating arms that create dramatic circular patchworks in the landscape—typically irrigate between fifty and 200 hectares each. 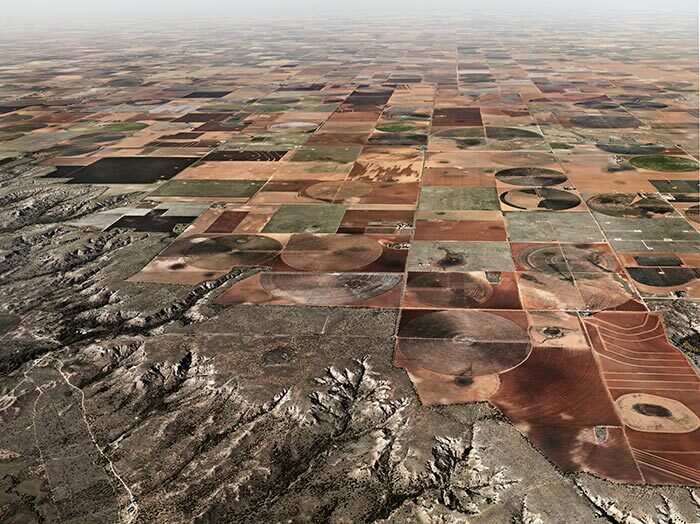 In the Texas Panhandle, this form of industrial agriculture depends on the recently discovered but rapidly disappearing Ogallala Aquifer, where water levels have dropped by 10 percent since the 1950s. Once exhausted, the aquifer will take at least 6,000 years to recover. Shasta Lake Reservoir, Northern California, 2009 Completed in 1945, the Shasta Dam was designed to control flooding and improve the prospects of Central Valley’s agrarian communities. Large corporations, not small towns, have been its primary beneficiaries. More prone to fluctuations than a natural lake, the reservoir has barren shorelines, and silt reduction has caused erosion downstream. Salmon populations have declined because of water temperature changes and obstacles to migration. Step-well No. 4, Sagar Kund Baori, Bundi, Rajasthan, India, 2010 Between AD 600 and 1850, more than 3,000 step-wells were built in Gujarat and Rajasthan. Annual monsoon rains fill the wells via underground aquifers, supplying water for the rest of the year. These hubs of religious and social life were reduced to garbage pits and latrines after the British introduced pumps and communal taps in the 1850s, but locals are now rediscovering their importance and value. Rice Terraces no. 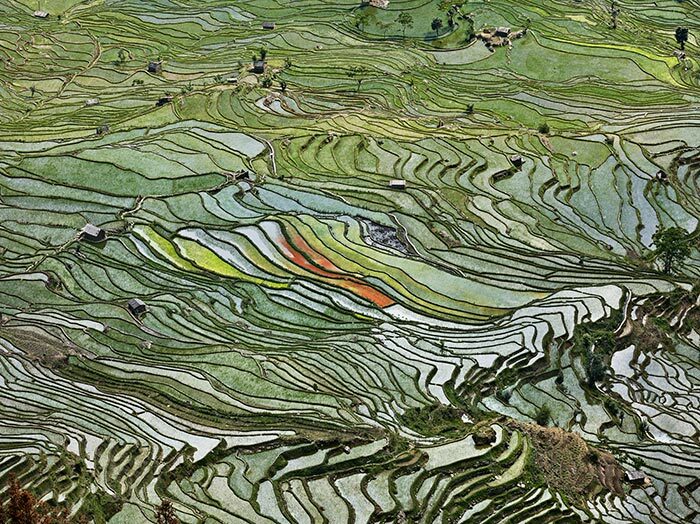 2, Western Yunnan Province, China, 2012 Aquaculture has been practised in China for at least 2,400 years, and terraced rice paddies can maintain high soil quality and great biodiversity. Molluscs, snails, shrimp, frogs, and fish are raised during the wet season, providing food and income while farmers await the rice harvest. The government promotes aquaculture as a means of alleviating rural poverty, but rapid industrial terracing fails to yield the same benefits, and has led to devastating deforestation and flooding in other regions. Oil Spill No. 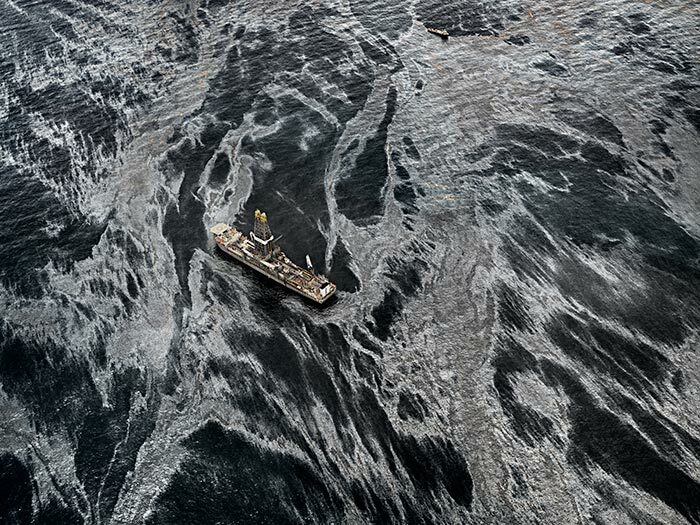 2, Discoverer Enterprise, Gulf of Mexico, 2010 This image was taken during the first six weeks of the Deepwater Horizon disaster off the coast of Louisiana. Before the BP oil spill, little was understood about the complexities of drilling over 1,500 metres below sea level. Misguided cleanup efforts have compounded the problem: by the end of 2012, the combination of oil and dispersants had increased toxicity in the Gulf by a factor of fifty-two. Post-disaster legislation has not prevented the approval of 136 new wells. 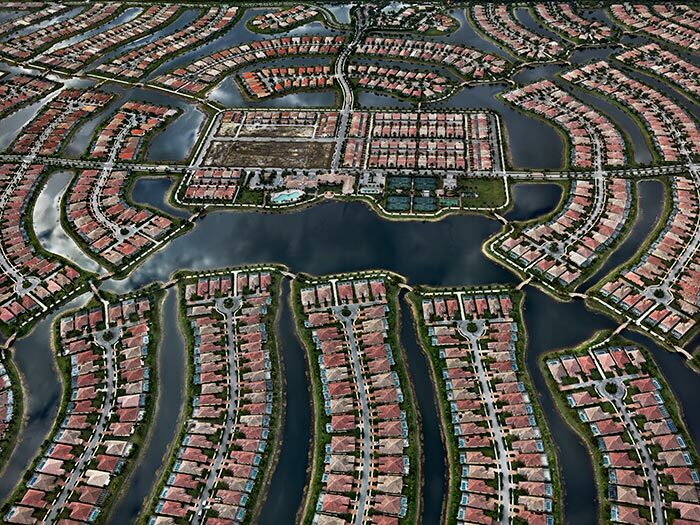 VeronaWalk, Naples, Florida, 2012 Affordable waterfront communities like the ones found in Naples or nearby Cape Coral are classic examples of the issues associated with rapid urban development within sensitive ecosystems. Cape Coral has the largest canal system in the world, but poor planning has led to a host of concerns; the canals suffer from algae blooms caused by urban runoff, and massive fish deaths occur often in the summertime. To this day, two-thirds of the city has no sewer system or access to waterlines. Kumbh Mela No. 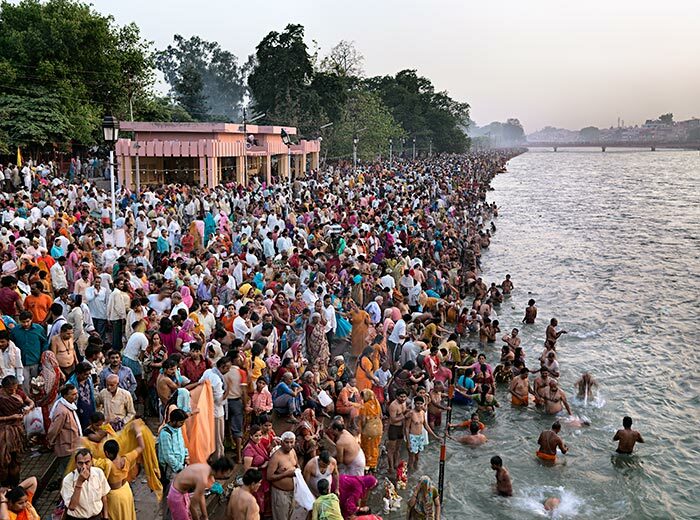 1, Haridwar, India, 2010 The Festival of the Pitcher, an annual Hindu event that celebrates the triumph of good over evil through communal sacred bathing, is held once every twelve years at the confluence of the Ganges and the Yamuna, and the mythical Saraswati River, at Allahabad. Visible from space, it is the largest gathering in human history: in 2013, over fifty-five days, 120 million people attended. Navajo Reservation/Suburb, Phoenix, Arizona, 2011 Here the hard borders of Navajo land meet the sprawl of suburban Phoenix, one of the largest urban centres by area in the US. Between 2007 and 2010, the growing metropolis significantly reduced its reliance on groundwater by diverting the Colorado and Salt Rivers. But over the past ten years, the region has experienced a drought, which is expected to continue for decades. More than 1,500 years ago, the Hohokam peoples built a civilization nearly as big as Phoenix, by creating the most extensive irrigated area in pre-modern America. After an extended drought in the mid-1400s dried up their surface water resources, they disappeared. 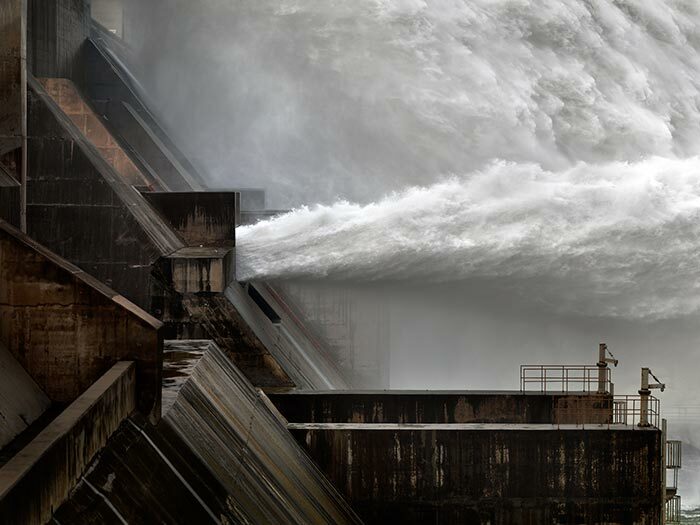 World-renowned photographer Edward Burtynsky, and acclaimed filmmakers Jennifer Baichwal and Nicholas de Pencier have been collaborating for nearly 15 years, starting with the award-winning documentaries Manufactured Landscapes (2006) and Watermark (2013). Their new project Anthropocene includes a documentary film (ANTHROPOCENE: The Human Epoch) which is now playing in select Canadian theatres, two complementary museum exhibitions now on at the Art Gallery of Ontario and National Gallery of Canada, and an art book published by Steidl. Canada started as a rough-and-tumble company, but is the march of progress now killing the country?